We were all amazed at how spacious the condo is. Every room has its own bathroom and TV. Very nice view of the beach. The unit is very clean and feels very luxurious and excessive in a sense. Each room is very quite. Unit built quality is great. Overall, we had a great experience! The condo was spotless and fully renovated and updated. Lots of towels and lots of large flat-screen televisions. The beds in the five bedrooms were wonderful. There were a few minor items missing when we arrived but the owner had them delivered in a flash. The patio was large and had an awesome view of the ocean. The pool and the furniture around it were well-maintained at all times, and you could walk right out onto the beach. Overall, we had a great experience with the property and the owner. This was a great place to stay. Clean and nicely furnished. Right on the beach with a shared pool as well. The condo was very spacious with plenty of room for our party of 10. The management staff was very pleasant and attentive to any questions we had. My family would definitely stay with Team La Copa again and will certainly look to return to this particular condo in the future. A very pleasant and enjoyable experience. Everything was amazing, perfect space, plenty of bathrooms, it is a perfect get away from home. This is a nice, new place in a great location on the beach. Very spacious and open living area. 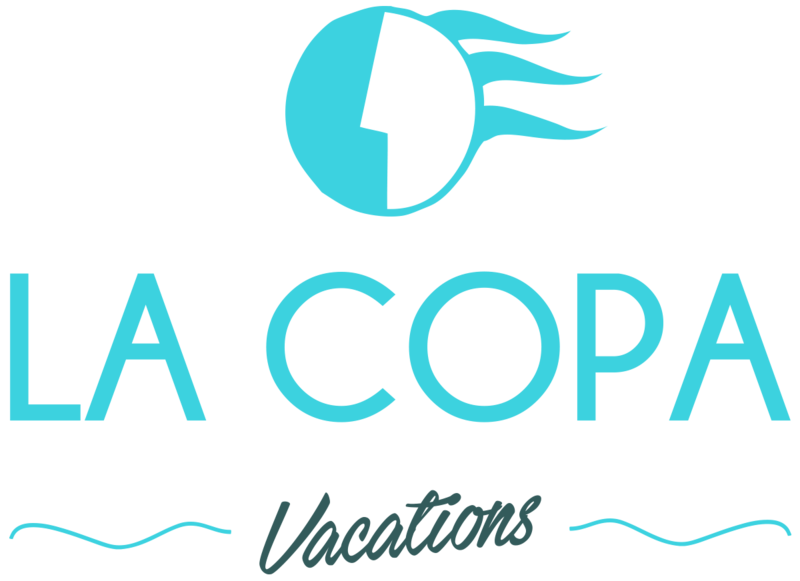 Team La Copa was readily available and responsive for any questions we had. Amazing condo and great service! Gorgeous condo, very spacious in all aspects. Excellent views, easy access to the beach. Nice pool and patio with charcoal BBQ's available. We loved our stay and plan to come back! Important to note that while the unit has everything needed for cooking it does not come with any additional basics like: paper towels, dish soap, laundry detergent, salt & pepper etc so you should pack those or stop at the local grocery store before you check in. It's a very comfortable Condo, great location to connect to the beach directly. The kitchen is well equipped, we cooked dinner and enjoy family atmosphere with friends. The decorations are very good, rooms are very clean. We had a wonderful weekend there. It was a great location and fresh interior. The view from the living area and master was lovely. Our families had a great time. This condo was amazing! We had such a good time and the condo was perfect for our family vacation! It was a great place for 7 of us - 4 adults 3 kids. Extremely spacious. The beach and pool great. Fabulous views. We really love SPI. Housekeeping spectaular. My only petty complaint is that the drapes are very heavy and dark and blocked views. Modern decor is also not my thing, but it is a fabulous spot. We had a wonderful week! Great place with even greater views. Perfect for groups of 5 to 10. Would rent again. By far exceeded our expectations. Highly recommend this condo if you're traveling with a large group. Plenty of bedrooms, beds and bathrooms. Amazing view of the ocean and easy access to the beach. Great place to friends and family! Very very nice place with a great ocean side view. Property is kept very clean and everything including pool and grill is cleaned daily. Would highly recommend to anyone wanting a getaway. Breakfast that is included is also good! This is an amazing place for the traveler. The condos were perfect for our weekend getaway. They were immaculate and check in/out was a snap. The 5 bedrooms were more than enough for 8 people to fit comfortably (two rooms have two beds each). The beach is very close and the walkable bars/restaurants were perfect. Great space for large gatherings with friends or family. Well worth it! Great location! We couldn’t have asked for anything more. I would stay here again in a heartbeat! We were a family of 6 adults and 1 toddler. We had an incredible stay due to many factors: first, it is literally right on a beautiful stretch of beach. Second, the condo was so spacious and nice and comfortable. We enjoyed our stay so much and cannot wait to return!!! We had a spectacular view that was burdened by the unfortunate cloudy/rainy weekend during our stay. All of the rooms were very spacious and tidy as portrayed, and it was great to have a bathroom off of each room; incredibly roomy! Using the available kitchen to cook for 10+ people was difficult, as there were not enough plates or silverware for that many. Lastly, the numerous flat screens were out of order due to an unresolved issue with the satellite dishes. Normally this is hardly worth complaining about, but given the weather during our stay, it made things a little trickier with 4 kids. Would definitely recommend this condo given that most of the problems mentioned above are easy fixes if addressed. We had a wonderful stay with amazing 180 degree views of the ocean in an absolutely gorgeous, huge, and very clean place with plenty of room for all of us. We did have some problems with the hot water, TVs and the dishwasher initially, but big shout-out to the maintenance guy on duty who got everything fixed immediately and was super pleasant to work with. We loved the added touch of being able to go to the free breakfast at La Copa Inn. The tacos and omelettes are amazing. Do not miss out on that! We will definitely want to come back again and highly recommend staying here. Great all together stay. The condo was amazing, would stay again! Beautiful condo on the ocean. Team La Copa knocked themselves out and provided over-the-top service. The space was very roomy and perfect for the six of us. We loved sitting on the balcony and watching the waves come in. This was our third stay at the property, and we will definitely be back. This place was absolutely wonderful. The only thing that is not stated online is the check-in is at the hotel, which is a couple of miles down the road. Plus, that is also where the complimentary breakfast is served, which was tasty! The condo has everything you need and easy access to the beach. Definitely one of the best places to stay!